Swirl? What’s a Swirl? A Swirl is a uniquely flattering, one piece, one seam, circular jacket with sculptured shaping and fluid fit. A Swirl is any one of eighteen patterns in four silhouettes, each with flexible sizing and styling options. A Swirl is elegant drape, lively motion and a mix of color, texture, and pattern across a sweeping form. The designs are unusual but easily done. Most require little more than basic knitting skills. All offer relaxing, rhythmic knitting at its best. A Swirl begins at the outer circular edge and proceeds toward the center in a series of concentric, welted rings that make up the collar, lapels, front and lower back portions of the garment. Once the circular form is completed, the remaining stitches are worked flat to create the bodice and sleeves. Lastly, one seam is sewn that runs from cuff to cuff, traveling around the front bodice and back neck along the way. The single seam serves as a minimal but essential frame from which the garment flows. Ironically, this all began with a rectangle that was long and wide and worked in garter stitch. I was captivated by the sculptural qualities displayed as I arched and bowed and twisted the fabric in space. Inspired, I designed a sweater I hoped would capture some of those same traits. While that piece still holds favored status in my wardrobe, it was far from the artful silhouette I set out to create. It was then that a friend came by wearing a circular sweater she had found on a recent trip to Italy. The light went on! I was thinking in static, horizontal and vertical terms when I needed to be thinking dynamically—in the round. The next day I sketched and thought and sketched some more. In my mind’s eye I began to see a slowly rotating, three-dimensional image grow from its circular base and take shape around an invisible female torso. With only a concept and the most rudimentary calculations to guide me, I cast on five hundred and sixty stitches and took off on one of the great journeys of my life. That first Swirl was Strata Sphere. Another twenty-five followed. More often than not, the results surprised me. Some seemed to knit themselves. Others demanded to be ripped out and reinvented again and again. Some—like the one I cut up, felted and turned into a knitting bag—had fatal flaws. I learned from them all and slowly began to understand the complex structural mechanics at work in my designs. What’s a Swirl? For a while there, aswirl was the state of my mind. Knitting the first welts of a Swirl is slow going, but each successive welt takes less time than the last. Along the way you find yourself marveling at completing five welts in the time it once took to do one. Shaping the bodice goes quickly, the sleeves less so. Then, suddenly you find yourself speeding down the slopes of the front bodice and, sooner than expected, binding off the last stitch. The pace of my journey has been much the same. Years of knitting, measuring, analyzing, calculating, illustrating and writing are suddenly done. There’s only one thing left to do. Let me take you for a Swirl! Sandra McIver was born and raised in New Orleans. That alone made her an unlikely candidate for her first career as a leading vintner in the California wine industry. Her interest in wine began while attending college in Northern California. In 1972 she acquired land in Sonoma County and planted her first vineyard. In 1977 she founded Matanzas Creek Winery, which quickly won acclaim for producing some of the finest wines in the industry. As winery president, she directed the winery’s growth from 2,000 to 45,000 cases annually. The Wine Spectator placed Sandra among the California wine industry’s top twenty leaders “Who Made a Difference;” proclaiming her as one who “innovated, perfected, promoted and led the international campaign for higher-quality wine.” After twenty-five years in the industry, she sold the winery, turned her attention to her lifelong love of knitting and embarked on the journey that led to the creation of knit, Swirl! This is her first book. It is astonishing that only simple knitting skills are needed to knit this most sophisticated of all sweaters….I believe this sweater is destined to become one of the most oft-knit, beloved and reliable knitting designs in history. As clever a book as it is gorgeous, knit, Swirl! presents a masterful use of simple knitting techniques to create a garment that – as I can personally attest – feels magnificent, showcases yarn to its fullest, and flatters all figures. Sandra’s Swirl is, indeed, the new Miracle Sweater. Stunning garments, beautiful photography, and endless variations on an innovative theme – this book is flawless. Sandra’s sweaters combine the perfect blend of simplicity and figure flattering shaping to entice knitters of all skill levels and sizes. Cookie A, author of Sock Innovation and knit. sock. love. The scope of work included in these pages is absolutely staggering. The presentation of Sandra’s work is at once thoughtful, intuitive and beautiful. An instant classic and a true treasure in our genre. Like the origami master who cuts a square of paper and finds a universe within its magical folds, Sandra McIver has created a unique sweater construction that is inspired and inspiring. 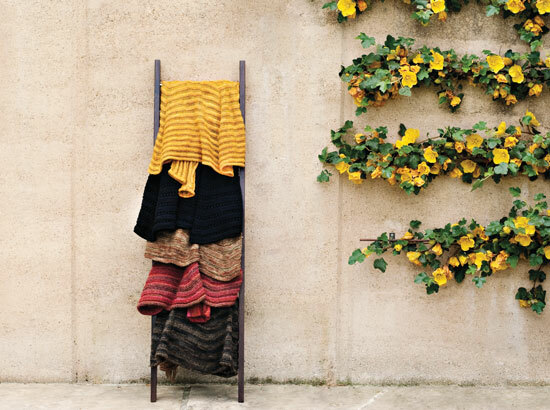 From a single shape she proposes a wardrobe of possibilities through pattern directions that are as much roadmaps of the designs as they are a foundation for the knitter’s own invention. You won’t be able to resist the urge to pick up needles and yarn.